Contact us today Contact us today for a FREE no-obligation quote – or to find out how we can help with your cleaning requirements! Welcome to my website. My name is Tony Clark, together with my wife Jackie; we own and operate Bourne Valley cleaning. We established our business specialising in carpet and upholstery cleaning in 1994 after working in the industry for many years. We are based in Addlestone, Surrey. Our aim was/is to provide superior quality carpet and upholstery cleaning to residential and commercial customers at fair and honest prices. To that end we have invested heavily in the latest and most technologically advanced machinery, equipment, cleaning solutions and training. On the following pages I want to provide you with as much information as possible about my company and carpet and upholstery cleaning. With this information you will be able to make an informed choice about who you select to clean your valuable furnishings. If I haven’t covered your particular question, please contact me directly by phone, email or via the contact us page. Based in Addlestone, Surrey we are a well established family run business. We have a great reputation and a dedication to customer satisfaction. 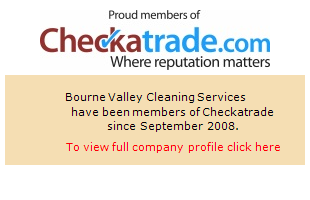 Why choose Bourne Valley Cleaning Services? We use the latest state of the art equipment. We are fully trained and certified. All carpet and upholstery cleaning is undertaken by myself and Jackie. Our aim is to provide a high quality and reliable cleaning service. We cover Surrey, Hampshire, Middlesex, Berkshire and Greater London. Our core business is carpet and upholstery cleaning for both domestic and commercial clients. Send us an email Contact us today for a FREE no-obligation quote – or to find out how we can help with your cleaning requirements! Based in Addlestone, Surrey we are a well established family run business. Our aim is to provide a high quality and reliable cleaning service. We cover Surrey, Hampshire, Middlesex and Berkshire. Our core business is carpet and upholstery cleaning for both domestic and commercial clients. Excellent service. Even came out to do a quote prior to job, most don't do that. On time and very helpful. I would be very happy to recommend them. Tony cleaned my three piece suite and done an absolutely superb job, saved me a small fortune on replacing. I would recommend them. Excellent service - carpets look like new. I would recommend them. © Copyright 2014 by Bourne Valley Carpet & Upholstery Cleaning. All Rights Reserved.